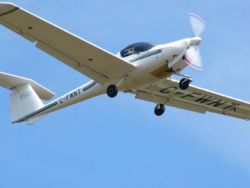 The Diamond DA20 is a two-seat tricycle gear general aviation airplane designed for flight training. 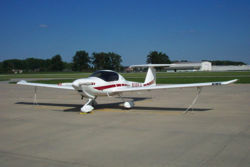 In addition to its role as a primary trainer, it enjoys a degree of popularity among pilot-owners. The aircraft takes advantage of all the latest state-of the art features and composite construction and has been regarded one of the safest general aviation aircraft in the industry. There are two basic models of the DA20. The A1 Katana, based on the DV20 Katana, is powered by a Rotax 912 engine rated for 80 or 100 hp (60 or 75 kW) and has a constant-speed propeller. The C1 Eclipse/Evolution is powered by a Continental IO-240 engine rated for 125 hp (93 kW) and has a fixed-pitch propeller. Both models have composite airframes constructed of glass- and carbon-fiber reinforced plastic. The DA20 has a similar mission to the Cessna 150, but there are many differences between the two airplanes. The DA20 has better performance, control sticks (as opposed to yokes), composite construction, a canopy, low wings, a single fuel tank, a T-tail, and a castering nosewheel. Performance is significantly increased by the liberal use of composites and tapered wingtips which reduces the effects of induced drag. Although the DA20 is available with instrumentation and avionics suitable for flight under instrument flight rules (IFR), the plastic airframe lacks the wire-mesh required to survive a lightning strike, and thus does not qualify for IFR certification. The DA20 is certified in the utility category, and it is permissible to intentionally spin it. Because the nosewheel of the DA20 is not linked to the rudder pedals, turns while taxiing must be made with differential braking. However, rudder effectiveness quickly becomes sufficient for control during the takeoff roll. The glide ratio of the DA20-C1 is an impressive 11:1 and the DA20-A1 is an outstanding 14:1. (For comparison, the Cessna 150 has a glide ratio of 7:1.) This can pose a challenge during landing if a no-flap landing is necessary, but can be greatly lessened with a moderate slip and is a significant advantage in the event of an engine failure. The bubble canopy results in a superb, helicopter-like view. Small windows on either side of the canopy can be opened on the ground and in flight to increase airflow through the cockpit. Furthermore, the canopy design lets in excess amounts of sunlight during early morning and late evening flights due to the low sun. The seats are not adjustable - they are exactly the same as the high performance Sukhoi Su-29 aircraft. This provides better occupant crash protection these seats have the highest safety rating in the general aviation industry. (Some pilots report that the recumbent seats in the DA20 are too reclined and that they lead to backaches after sitting for several hours; experienced DA20 owners state that this is only a problem when a C or P type pilot tries to sit upright instead of relaxing into the reclined seat.) The seats in the C1 variant have a less obtuse angle, but still are not adjustable. Both models are available with cloth or leather seats. The DA20 is a relatively young design. The first DA20 was the Rotax 912 powered A1 Katana produced in Canada in 1994. It was the first Diamond aircraft available for sale in North America. Production of the Continental IO-240-B3B powered C1 Evolution and Eclipse models began in 1998, also in Canada. In 2004, Diamond received Chinese certification for the DA20. (The DA20 has always been certified in the United States, Canada, and JAA member states.) The DA20-C1 is still in production. Embry-Riddle Aeronautical University provides primary flight training for the United States Air Force Academy in DA20-C1 "Falcons" which were specially ordered with slightly smaller fuel tanks and primary flight instruments on the right side of the aircraft. 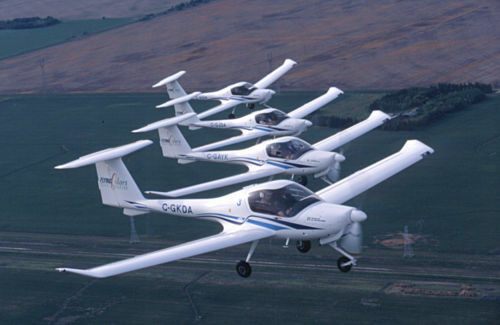 Embry-Riddle currently operates a fleet of 18 DA20s at the Academy. Doss Aviation, after being awarded a contract for US Air Force ROTC primary flight training in Pueblo, CO, has ordered 42 DA20s. This page was last edited on 6 March 2007, at 03:18.